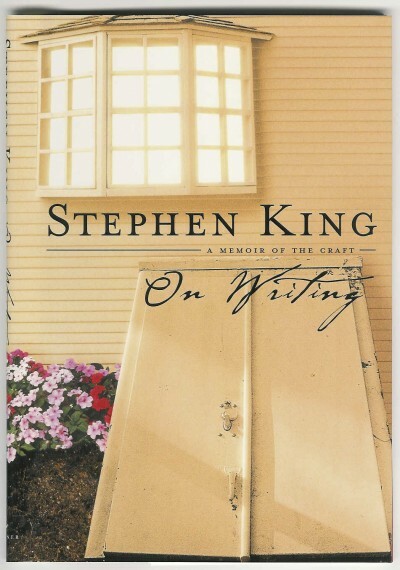 I first read Stephen King’s On Writing: A Memoir of the Craft on a summer break, home from college. I read most of it sitting on the family room couch while the TV was on. I remember sitting down to watch said TV, then finding myself opening the book without intending to, beguiled away from television. This happens to me with certain books, usually memoirs that have easy prose and an intimate narration. There might not be a dramatic plot enticing me to read on, but just seeing the book on the couch is enough to get me to read a few pages, even if I sat down with less than literary intentions. Inspired by Ashley‘s video on her favorite writing books, I just finished a re-read. Still beguiling. The snippets of King’s childhood and early adulthood read like you are peeking into his life through small but very clean windows – you can see everything quite clearly. The second half – the craft portion – isn’t revolutionary. Calm assurances. Jokes. Reminders. Do this thing, this writing thing, with care. Tell stories and take stories seriously. Maybe this is one of my many low-brow habits, but I like nonfiction that feels like a friend. Like family, even. Books that speak of the things that are dear to my heart. Books that speak with the authority of one who’s spent time in the trenches, an author who isn’t afraid to talk about the painful, crummy bits, but also about the rest. How running connects us with our bodies and the bodies of our ancestors. How self-care can change the way you see your life and the rest of the world. How vulnerability can crack your soul open and let good things flow in. How in a society where pleasure is easy to grasp, the pursuit of happiness is still an ideal worth holding. I am now wishing that I had a copy of On Writing to add to my read and re-read and re-read shelf. And also wishing that Stephen King could be my uncle, sending me encouraging emails, reminding me not to take myself too seriously, sending me a new copy of The Elements of Style for Christmas. I am in dire need of The Elements of Style as a gift for the holidays. Good thing my birthday is next month! I had a chance to read this in college (I chose to be in the group reading Bird by Bird instead) but didn’t because I was too afraid to read anything by Stephen King (feel free to laugh). And to be honest, I haven’t thought about it since. But you make it sound like a worthwhile (and scaredy-cat friendly) read, so I’ll try it! I loved On Writing. It’s one of few “how to write” books I can say that about — another is The Forest for the Trees by Betsy Lerner. She keeps a very entertaining blog. And since we’re on the topic of The Elements of Style, I highly recommend Maira Kalman’s illustrated edition.